Do you need to orchestrate software development and delivery in your complex, heterogeneous environment but you’re not sure where to start? Have you heard about SAFe but you don’t know what it is or why you should care? New in Rational Team Concert V6.0 is a feature that supports the Scaled Agile Framework® (SAFe) out of the box. This feature enables you to explore the framework and establish a SAFe Program of your own, complete with the infrastructure, artifacts, best practices, and guidance prescribed by SAFe built right into the tooling. SAFe is the market-leading process framework for scaling lean and agile across the enterprise, providing guidance and best practices to help organizations realize success. 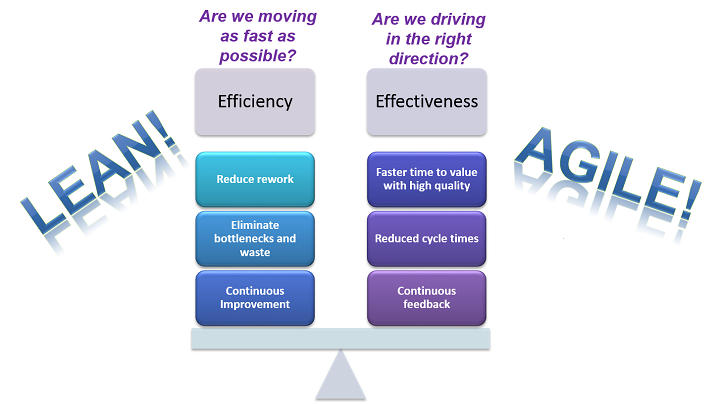 SAFe with the Power of IBM DevOps is the combination of SAFe plus IBM DevOps to provide a comprehensive process and tooling framework that helps your organization balance the efficiencies gained through adoption of lean principles with the effectiveness realized through agile adoption to deliver the right things right. The result is a framework which synchronizes development, testing and deployment across teams in heterogeneous environments, and enables collaboration of all roles in the organization in the planning and execution of software delivery. The SAFe support in Rational Team Concert V6.0 provides an easy way for you to get up and running quickly to lead a SAFe-based transformation. Whether you are a SAFe novice who is just starting to explore, or an expert who is quite familiar with what it means to “do SAFe”, our support combines the flexibility and scale you need to support true enterprise teams using multiple processes, technologies, and tooling. Let’s take a look at a few details. Rational Team Concert 6.0 includes a new SAFe 3.0 Program process template that helps you to easily establish a SAFe Program-level tooling infrastructure. When you use the template to create a Rational Team Concert project area, you will get out-of-the-box support for Programs and Teams wanting to incorporate agile and lean practices into the development and delivery of software with SAFe best practices and guidance. This includes an Agile Release Train timeline, SAFe roles and permissions, and a SAFe Program/Team hierarchy with associated work item categories. While the project area is configured to support SAFe Programs with Teams in the same Rational Team Concert project area, it can easily be used to support Programs that are tracking the work of existing Teams in separate project areas as well. Furthermore, it can be used to establish project areas for SAFe Teams separate from the Program because the process template includes updated Scrum elements that are aligned with SAFe. 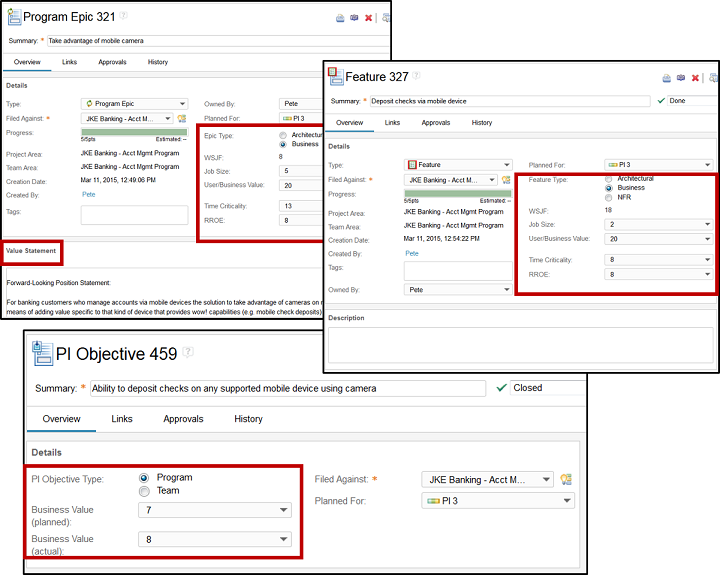 Simple editing of the project area configuration provides you with the flexibility you need to support multiple different Program and Team topologies. SAFe artifacts are manifested in Rational Team Concert through work item types, plan types, and plan views. These artifacts support the most critical SAFe best practices, including relative ranking based on Weighted Shortest Job First (WSJF), Kanban planning, and Program value-based delivery. 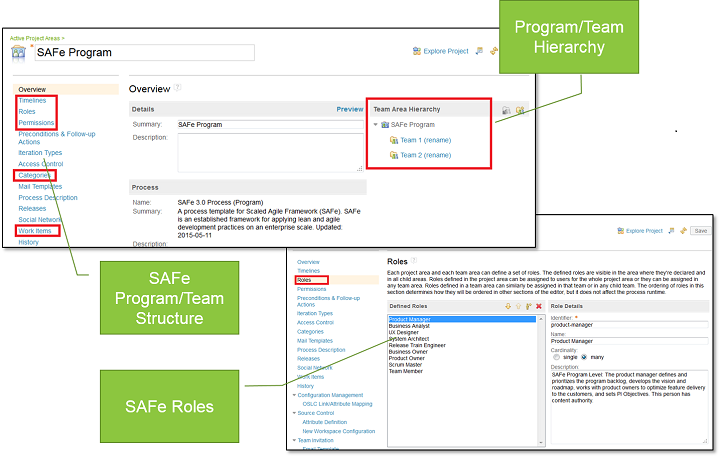 The process template includes Program Epic and Feature work item types for the SAFe Program level, Story and Task work item types for the SAFe Team level, and PI Objectives for both Program and Team levels. Additional work item types for Defect, Risk, and Retrospective are also included. The WSJF component attributes (User/Business Value, Time Criticality, RR/OE, and Job Size) are provided as Fibonacci enumerations, which can be tailored to suit your organization’s preferences. For the Epic, we also provide a Value Statement template to remind you of how best to articulate Program Epics. The PI Objective is a way to track value delivery, which is a critical aspect of Enterprise Scaled Agile and IBM DevOps principles. By capturing the notion of planned and actual value delivery, we can provide you with insights into your organization’s ability to deliver value to your business and to customers. Plan Views provided by the process template enable high-value SAFe processes. 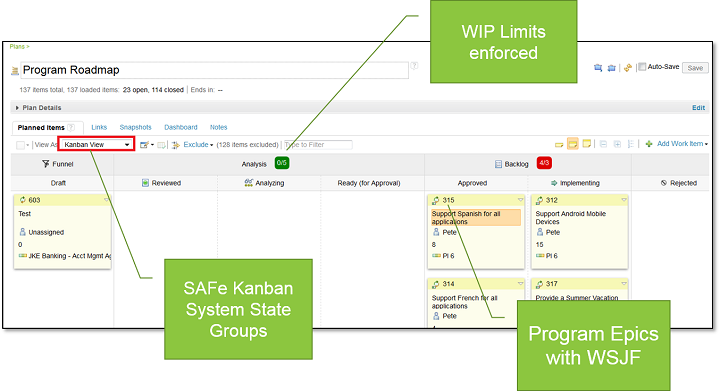 The SAFe Kanban System for Program Epics is a visual representation of rank and status. The ability to capture and enforce Work in Progress (WIP) limits enables your team to practice the lean principle of “just enough” investment, reminding you again to take an economic view in decision-making. The WSJF Ranked List view takes this concept a step further by helping your team learn how to quickly and relatively rank Features based on WSJF. Remember, it is not about high value alone, but the “biggest bang for the buck”. This plan view helps your team learn how to consistently rank Features to maximize benefit—to your customers as well as to your business. We also augment the SAFe guidance with our own, applying the knowledge of our experience working with enterprise customers to create incisive reports that you can use to drive decision-making. In particular, we provide insight into cross-team dependencies to help you address a critical pain point in managing software development and delivery across the Program. All of the work item tasks describe activities consistent with those prescribed by SAFe and include in-context mentoring via a direct link to the topic described by the task on the SAFe website. This enables you to learn as you go and helps to ease adoption of SAFe, step by step. While no tool alone can plan for you or make your teams collaborate, IBM’s SAFe solution can greatly simplify the transformation through tooling integrated with process guidance, coupled with the right data to help with your decision-making. I hope you like what you see. We would appreciate any and all feedback as we enhance our SAFe support going forward. As always, visit the Collaborative Lifecycle Management and Rational Team Concert What’s Happening sections for the latest news. And to keep abreast of everything related to our SAFe support now and in the future, please visit our SAFe landing page on the IBM DevOps Community and check back often for updates! Nice article. Is there anything around the program board and how to view the dependencies across the ARTs? Would you have a sample view of the same from RTC. Thanks, glad it was helpful. We don’t yet have a true Program Board (visualization ala SAFe for dependencies) but it is on our backlog. 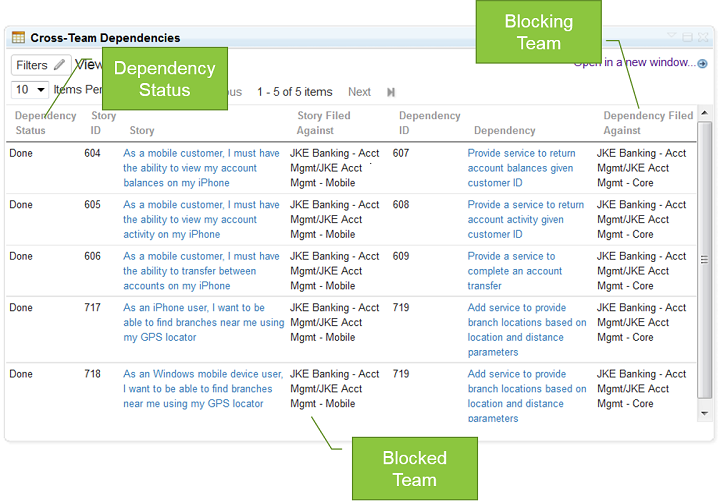 The Cross-Team Dependencies report I show above in my article is what we have today — textual view of dependencies. I am working on creating that report graphically. The dependencies are captured via the Blocks/Depends On relationship. We are also working on a way to mark cards on a Kanban board as blocked with a reason, so that would give some level of visualization. Great article! As organizations embrace SAFe the agile PPM will become a critical part of the cultural change, can we assume RTC will also be usable by the Portfolio Mgmt team? 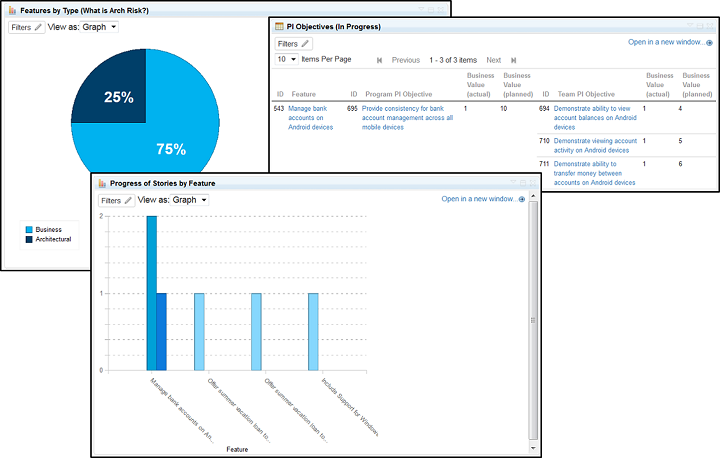 If not are there best practices for integrating the use of other agile PPM tools with RTC? Thanks for the feedback, appreciate it! SAFe Portfolio planning and the organizational and cultural changes that need to occur for this kind of transformation are certainly critical. We are currently working on the SAFe Portfolio support and will be posting beta templates for evaluation. What we will support initially, and what aligns with SAFe Portfolio, is more like portfolio “planning” as opposed to PPM. The decisions that are made as a result of PPM activities are fed into the SAFe Portfolio (e.g. how much money can we/should we spend on X, how do we balance our investments, what trade-offs do we need to make). Our solution for Portfolio will be a CLM-wide solution. Watch our SAFe Landing page (http://ibm.biz/safesupport) for information on this as we develop it. What is – or will be – the support to team areas that are outside of the RTC project area? For example, would a team area from Bluemix DevOps Services be visible inside the RTC project area, so it is considered part of the program as well? It seems that in a “2-speed IT” situation, where System of Record and System of Engagement teams deliver at different paces, this type of coordination and visibility across teams would be required. This is a great question and one we have also considered, not only because of the “2-speed IT” scenario but also because in many enterprise environments, a variety of teams must be supported including those that are outsourced. While ideal, there is no guarantee that any single tool would be used at the team level. In this kind of environment, we provide two options: centralized control at the SCM level or synchornization with Rational Lifecycle Integration Adapters. To support an environment where some teams are developing on Bluemix DevOps Services, you could centralize on the Git SCM on-premise, using RTC to manage the teams as part of a SAFe Program. The Bluemix DevOps Services team would be represented in the SAFe Program and visibility to their work is available. As they do development on the cloud, they may manage their own changes separately from the Program but ultimately “production-level” changes occur in the on-prem SCM. This is not dissimilar to how an enterprise supports the work of outsourced teams in fact. If you want to synchronize the work across multiple teams using disparate tooling, Rational Lifecycle Integration Adapters provides a variety of integrations to the most popular third-party development tooling. In this case, a synchronizer is defined that enables the RTC-based SAFe Program to have visibility into the work of the teams, but the teams’ work is managed outside the Program. Similar conceptually to the first scenario. Both of these solutions are available today.